QTY 1234567891011121314151617181920 Please select a quantity. Raymarine’s RV-100 All-In-One Transom Mount Transducer lets you easily identify structures and locate fish with the life-like clarity of RealVision 3D sonar. The RV-100 is a 4-channel, Wide Spectrum CHIRP transducer with DownVision™, SideVision™, high frequency CHIRP fish targeting and RealVision 3D™ sonar inside. The transducer has a built-in attitude and heading reference system (AHRS) that stabilizes the sonar imagery, automatically compensating for vessel motion. You’ll enjoy crystal-clear imagery in waves, swells and while maneuvering. The RV-100 also has a built-in fast response water temperature sensor for quick, accurate readings. The RV-100 is designed for easy transom mounting on outboard-powered motor boats. 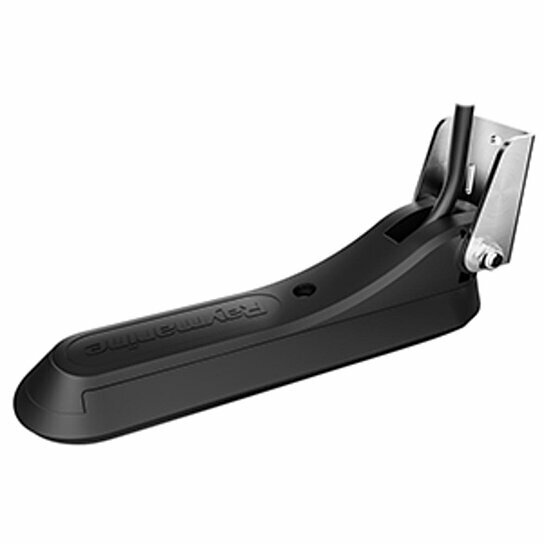 It features a rugged, marine-grade stainless steel mounting bracket with integrated kick-up to prevent damage in the event of a strike with floating debris, rocks, or stumps.